Webinars offer an excellent way to start or sustain strong business relationships that make money. If you do them well, that is. 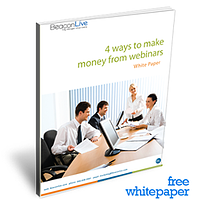 And despite your past experiences with hosting webinars, you can actually make money from them in a number of ways! Have attendees qualify themselves as leads and convert them into paying customers... and more! Ready to make money from your next virtual event? Complete the form to get our free guide now!